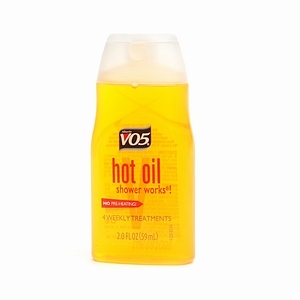 Alberto VO5 Hot Oil Shower Works Weekly Deep Conditioning Treatment is one of those drugstore finds that will be a staple in your hair routine. If you have very dry and/or coarse hair (be it relaxed, naturally curly, wavy or straight), this treatment does exactly what it says - making hair soft and smooth, and for a great price too! I will start out by saying that in order to get good results from this product, you MUST follow the directions. After applying approximately 1/4 or the bottle, massage into the hair and leave on for exactly 1MINUTE - not 2, 3, or 5....Then you rinse out and apply your shampoo. The ingredients are formulated to work with the heat of the shower and give your hair the softening and hydrating treatment within the 1 minute. It's a great product to keep on hand for very harsh/dry/cold climates can also help stop hair breakage, especially in relaxed and curly hair. You do not need to follow up with another conditioner, (unless you need a heat protecting product or leave in conditioner for your styling). It's very lightweight, distributes very easily in the hair (a wide tooth comb is a perfect tool for this) and has a prominent (but pleasant) floral scent. If you have very long/very dry hair, a weekly treatment will be great, however, if you have fine or shorter hair, you may only need to apply every other week or so. This is very fine blog. I got meaningful information from this. Keep it up.